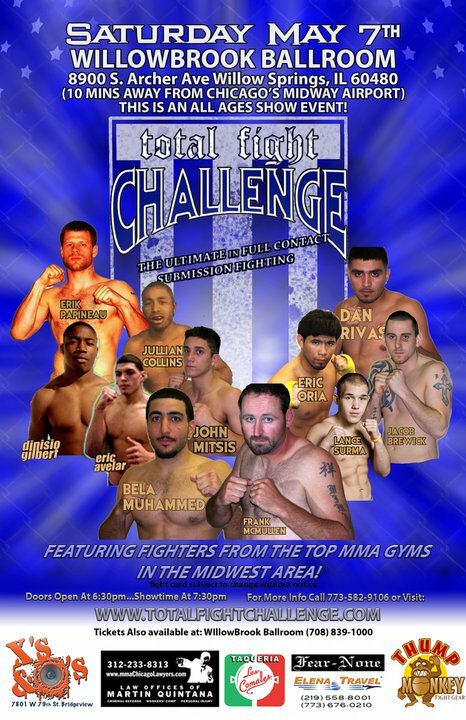 Total Fight Challenge is back in Willow Springs on Saturday, May 7th at the Willowbrook Ballroom. » Eric Oria looks to remain undefeated as an amateur. He is 3-0 with all 3 wins coming in previous Total Fight Challenge events. » Eric Papineau fought to a draw in his first amateur bout. Since then he has won three straight fights. Two victories were by sub and on TKO. » Jacob Brewick comes back to fight for the first time since 2009. He ended the year with a 3-fight win streak but has not fought since. More fight card info to come, and see the poster below for ticket info.